The objective of this project is to design and construct a controller that will operate two geared stepper motors so that they can operate a model lift bridge. One stepper motor will be in each of the bridge's towers. When an activation button is pushed the motors will operate together to evenly lift the bridge to a set height. When the button is pressed again the bridge will return to its lowered position. While the motors are in motion a relay will be closed activating two SPST normally open switches that will be used to activate sound generating units. The stepper motors are 6 wire unipolar steppers that are controlled by a TI SN754410NE H-Bridge that is connected to a PIC 16fF84 microcontroller. The PIC sends pulses to the H-Bridge that move the motor in 1 degree/step increments in either a clockwise or counter clockwise direction. A DPDT relay is used to provide two NO SPST contacts that can be used to activate sounds or other accessories. Here the microcontroller board is shown (top left / green board) along with the auxiliary board (bottom left / brown board) and the two geared Hurst stepper motors. In this view of the microcontroller board the programming jumper is in the upper right area. Power is applied in the lower right. The IR sensor is in the upper left next to the yellow LED. The stepper motors connect to the two six pin headers on the left side of the second board, seen below. The activation switch (which moves the bridge up or down) connects at the bottom center and the sound unit or other accessory connect via the screw terminals on the bottom left. Configuration is done be by way of an infrared TV remote control unit. 2. 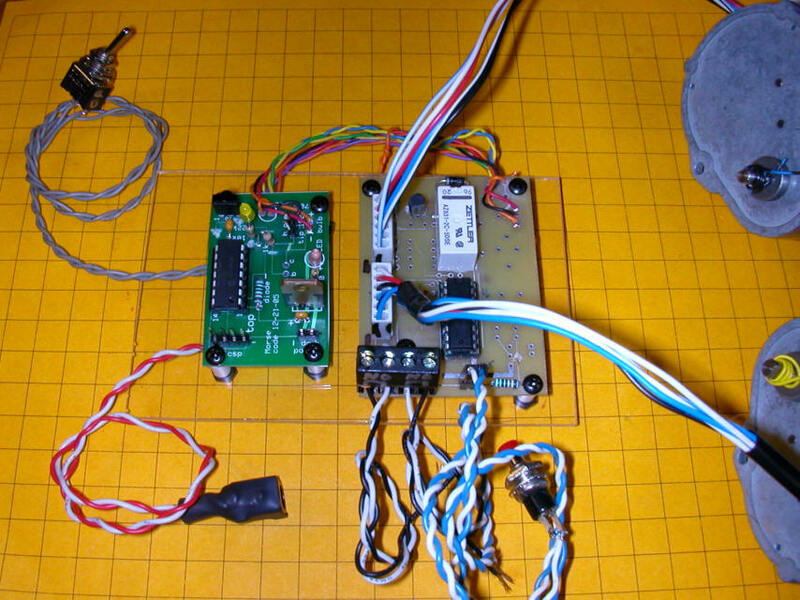 Connect both stepper motors and supply power to the board. The red power LED should light. 3. On the remote control press the right arrow (VOL+). The motors make one rotation (360 steps / 360 degrees) in a clockwise (CW) direction. 4. Press the left arrow (VOL-) and the motors make one rotation counter clockwise (CCW). 5. Press the up arrow (CHAN+) and the motors rotate 45 steps (45 degree) CW - note this step rate can be changed. 6. Press the down arrow (CHAN-) for 45 steps CCW. 2. Type a 4 digit number of degrees, for example 0720 for 2 rotations (720 degrees) - note that the LED flashes out each digit as it is entered - please allow time for each digit to flash out before entering the next digit. 3. After the 4th digit has been entered and flashed out the motors will rotate once CW and once CCW the number of degrees entered. 4. Press either CHAN+ or CHAN- to move the motors the programmed amount. Once the proper number of steps has been determined and programmed remove the programming jumper. You can store it by putting in on one of the two pins. Pressing the UP/DOWN button will move the motors the programmed number of degrees. The first press of UP/DOWN moves the motors CW. The second press moves the CCW. Note. If power is lost while the bridge is up the unit will remember that is was up and the next press will put the bridge down. If power is lost in the middle of an up or down operation the bridge controller will not know where the bridge was stopped and the unit must be reset by with the remote control unit - (install the programming jumper and use the 1-6 keys (as above) to move the bridge to the bottom or top position before restarting. Connect the unit as below for testing. The grey wires on the left go to the Program / Operate toggle switch. In the program position the remote control can change setting and align the motors. In the Operate setting the push button (at the end of the blue/white wires) activates the motors either up or down. Note that the blue / white wires terminate in a small plug that goes into the board next to the black screw terminal connector. The red/white wires in the lower left terminate in a power connector that goes to the power supply. The two pairs of black / white wires are for the NO contacts on the relay. They connect via the two sets of screw terminals marked NO. The motors connect as in the photo below. There is a black mark on one end of each connector that goes next to the black mark on the board. This modification to the circuit above utilizes a 16F88 PIC processor and the circuit board that was originally designed for the train speedometer.